Use free Photoshop actions to turn hours of design time into just one click. If you want the best free Photoshop actions, you've come to the right place. But what are Photoshop actions? Well, Adobe's flagship image editing software has an inbuilt programming language that completes hours of design work in just one click. Photoshop actions record tasks as an 'action' and replay the steps to complete the task automatically - a pretty cool timesaver. Not only can you record your own Photoshop actions, you can also import free Photoshop actions. This opens up a whole range of shiny new effects and an opportunity to learn them, saving you huge amounts of time now and in the future. Your projects will look better than ever. We've rounded up the best free Photoshop actions in this list, but if you feel inspired to expand your Photoshop skill set you can head over to our roundups of the best Photoshop plugins and Photoshop brushes, great for photographers, graphic designers, game artists and more. You can jump to the section you want right now from the drop-down menu above, but you should definitely bookmark the entire list of free Photoshop actions to check out the rest later – who knows where inspiration will strike. This free Photoshop action does exactly what its name would suggest. It will give your image a super-strong matte finish. If you want a lighter matte finish, they have a basic version too, but we love the intensity of this one. 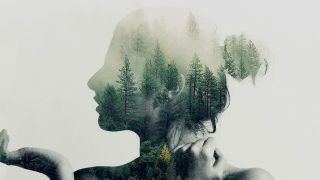 This awesome free Photoshop action creates a professional double exposure effect instantaneously. When the action has finished, you can add a colour tone or gradient to your image to complete your composition. You have to register with the site (for free) before you can download, but the site has so many great free Photoshop actions, it's definitely worth it. Give washed-out photos an instant burst of colour with this free Photoshop action from Shutter Pulse. One of its set of 14 Boosters Photoshop Actions, it comes as part of a free bundle of 20 Lightroom presets and 20 Photoshop actions, and it'll bring any photo a much needed dash of colour and constrast. Another way to breathe fresh life into your photos is with this set of 40 pastel effect Photoshop actions; they'll provide instant light enhancement and beautiful colour toning at the touch of a button, and transform ordinary shots into something much more Instagram-worthy. Give your photos an other-worldly air with this Photoshop action from Megan Joy. It'll infuse landscapes with a magical purple haze, enlivening any shot with an ethereal purple haze and giving any location the atmosphere of a mysterious fairy dell. For those times you want to give your photos a one-click Instagram effect, Instant Hipster's the perfect solution. It comes with 10 ready-made filters – Amaro, Mayfair, Hudson, Valencia, X-Pro II, Willow, Sutro, Hefe, Nashville and 1977 – so you can find just the retro effect you need in seconds. If your photos just aren't sinister enough for your liking, this free action should make things a little more unsettling. It's designed to let you easily give your photos a dark, haunting effect. Perfect for creating the impression that you're permanently about to stumble into mortal danger. If you'd prefer to cheer up your images, take a sunny shot and make it intensely summery with this great turquoise haze effect. Outdoor portraits taken in natural light are most suitable for this filter. Perfect for outdoor pictures, the Hazy Afternoon action certainly lives up to its name by creating a soft gradient colour layer. You can use this free action on black and white or colour images, plus you can easily adjust the gradient until you get the exact look you're after. Light up any image with this comprehensive collection of sunlight effects that'll brighten and tone even the drabbest landscape. Simply add a bit of a warm tone, or go the whole hog and throw in a setting sun complete with a lens flare effect; it's all there. This free Photoshop action washes out some of the colour from an image and gives it a purpley hue. It's a good way to give your photographs a dramatically downbeat look.